Join us for a trolley tour of The Woodlawn Cemetery, a 400-acre destination in the northern part of the Bronx. Designed by James C. Sidney in the rural style on rolling hills, the nonsectarian cemetery opened during the Civil War in 1863. The ceremonial burial there of Admiral David Farragut in 1870 spurred interest in the cemetery, and it became the final resting place of many well known figures in American history. Herman Melville, Thomas Nast, Nelly Bly and F.W. Woolworth are among those interred here. It has one of the most impressive collections of mausoleums in NewYork, perhaps in the nation. Designers of monuments in the cemetery include James Renwick, Stanford White, John Russell Pope, Carrere and Hastings, Cass Gilbert, Louis Comfort Tiffany and John La Farge. On our tour we will see the graves of entrepreneurs and wealthy socialites of the Victorian era. 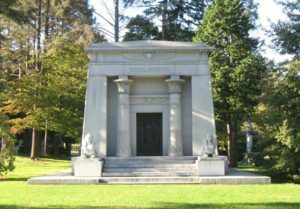 A highlight of the tour will be a chance to enter the Belmont Mausoleum where Alva Vanderbilt Belmont and her husband Oliver, a one-term congressman, are entombed. Designed by Richard Morris Hunt, its exterior is a replica of the French Chapel of St. Hubert at Chateau d’Amboise. The cemetery was designated a National Historic Landmark in 2011.